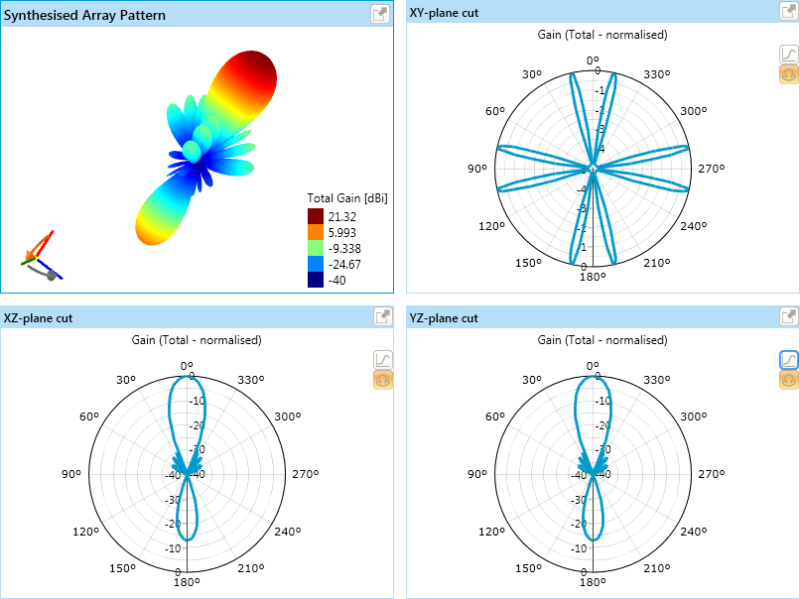 Antenna Magus contains a wide collection of antenna array configurations .This application note discusses the Antenna Magus workflow for exploring and synthesizing these antenna arrays. We go through the typical workflow of designing an array for two different array configurations and then compare their results. If you are unfamiliar with Antenna Magus it is suggested that you briefly familiarize yourself with the main components of the user interface. A short application note on the basic layout of the user interface is available here. We can also select a configuration by using the drop-down menus in the 'Pallet'. 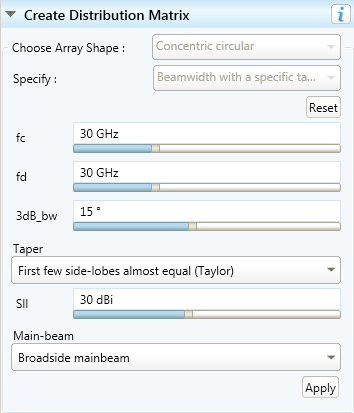 The first array that we will look at is a planar array with broadside directivity. 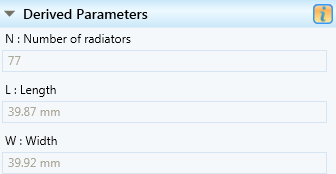 In the 'Arrays' expander rename the design from "Array 1" to "Planar Array". In the 'Create Distribution Matrix' expander select 'planar' from the 'Choose Array Shape' drop-down. 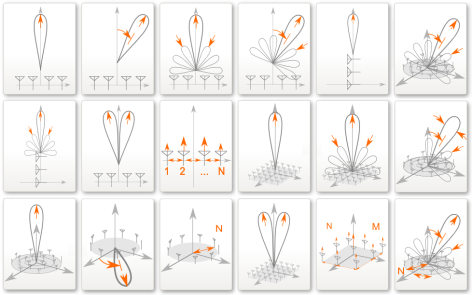 We are now presented with specific planar configurations in the 'Specify' drop-down. 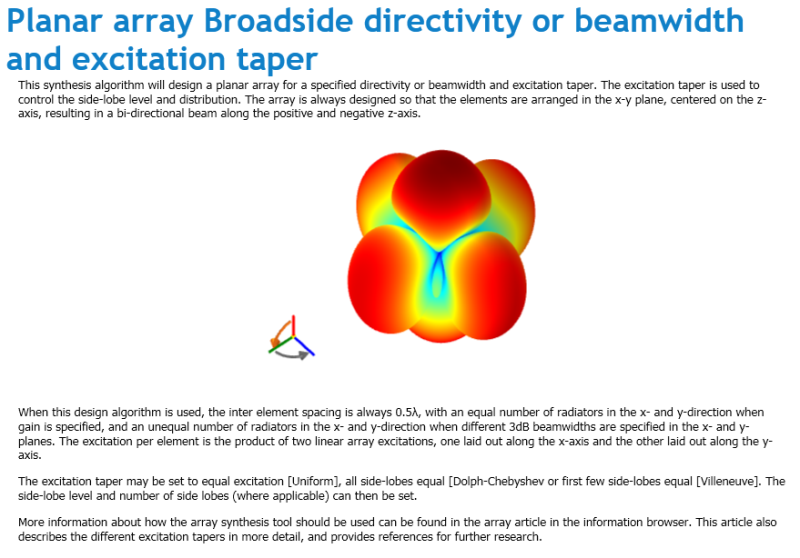 Select the '+ Exitation taper' option of the 'Broadside directivity or beamwidth' configuration. Click on 'Set Up' to choose the specific configuration. In the 'Workspace' we are presented with additional information on this configuration. We are also presented with additional design options in the 'Create Distribution Matix' expander. 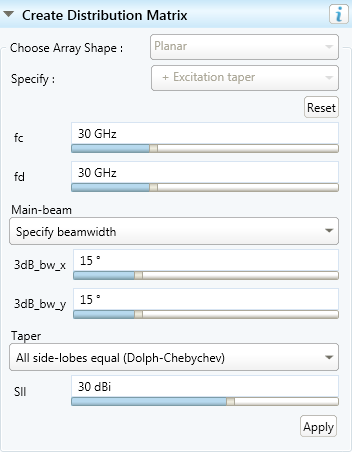 Set the centre - and display frequency both to 30GHz. Choose 'Specify beamwidth' in the 'Main-beam' drop-down and set the value to 15 degrees in both the x and y direction. 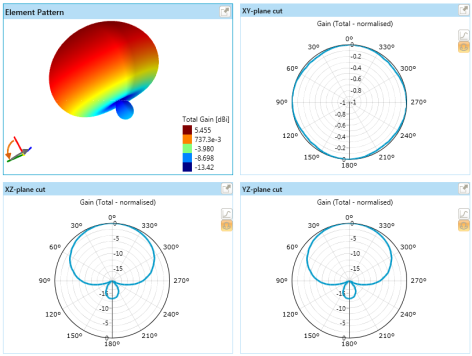 In the 'Taper' drop-down select 'All side lobes equal' and set the Side-lobe level to 30dBi. Click on 'Apply' after entering all the parameters. At the bottom of the 'Pallete' we see the 'Derived Parameters' expander. Here we note that the number of elements required for design objective is 64. 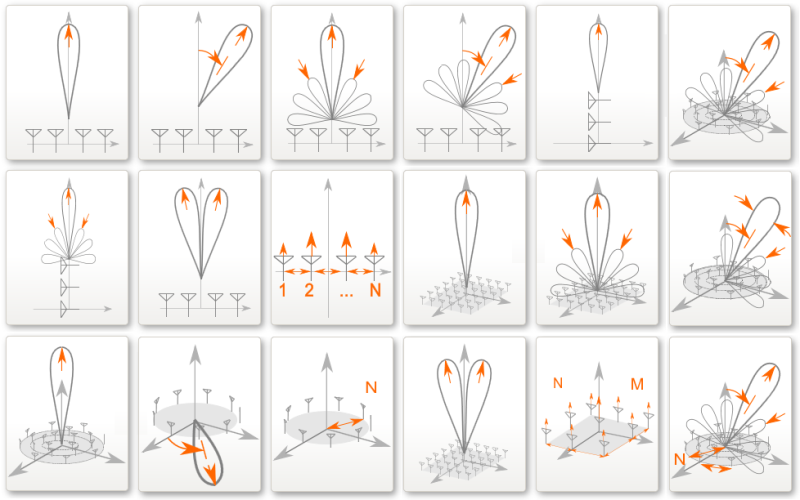 To synthesise the array for a specific antenna element, we can specify a node on the 'Element Pattern' tab. Switch to this tab and select 'Left-hand circular QHA' from the drop-down. Select 'Z' from the 'D_max' drop-down and click on 'Apply'. 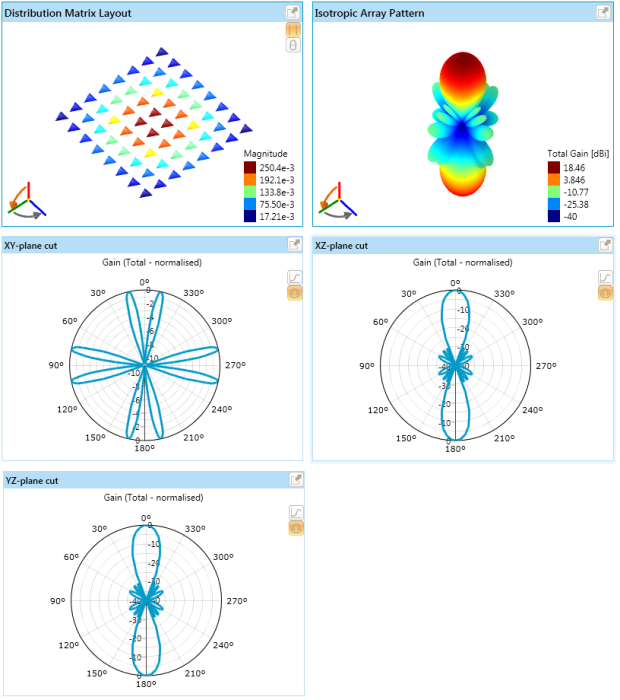 The radiation pattern for the antenna is displayed in the workspace (shown below). This radiation pattern will be used as the element patterns in the synthesis of the array. Note that custom element patterns can also be imported. 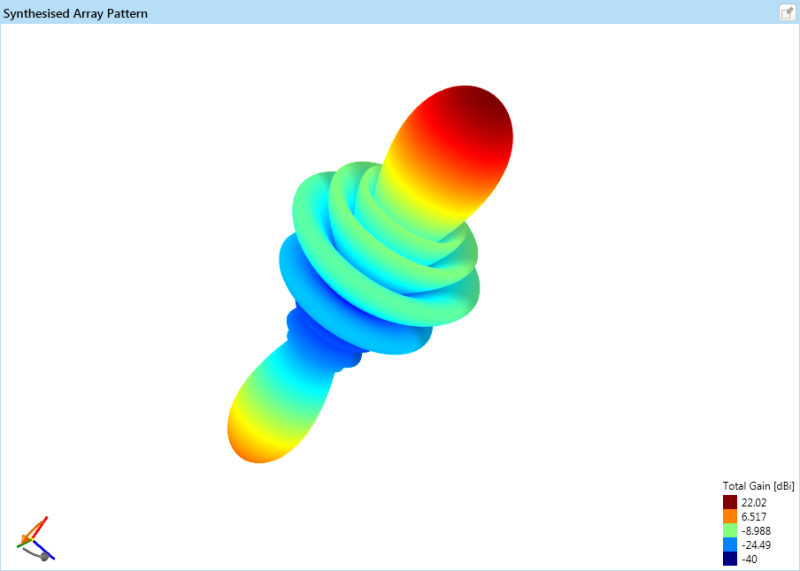 Navigate to the 'Synthesised Array' tab to view the results of the synthesised array (shown below). Synthesizing the Concentric Circular Array is a similar process as that described above. Start a new array design by clicking 'New Array' in the 'Arrays' expander or in the 'Home' ribbon. Again the collection of array configurations is displayed in the workspace. 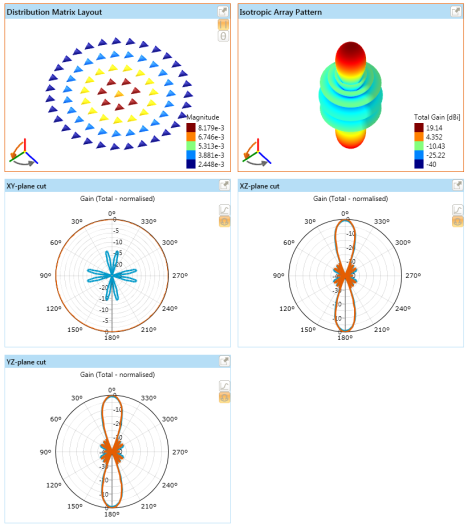 In the 'Create Distribution Matrix' set the value for 'Choose Array Shape' to 'Concentric circular' and the value of 'Specify' to 'Beamwidth with a specific taper and steering angle'. Click on 'Set up' to select this configuration. Information for the selected configuration is displayed in the workspace. Additional input parameters are displayed in the 'Create Distribution Matrix' expander. 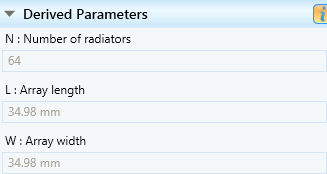 Set values in the expander to the values shown in the image below and click on 'Apply'. 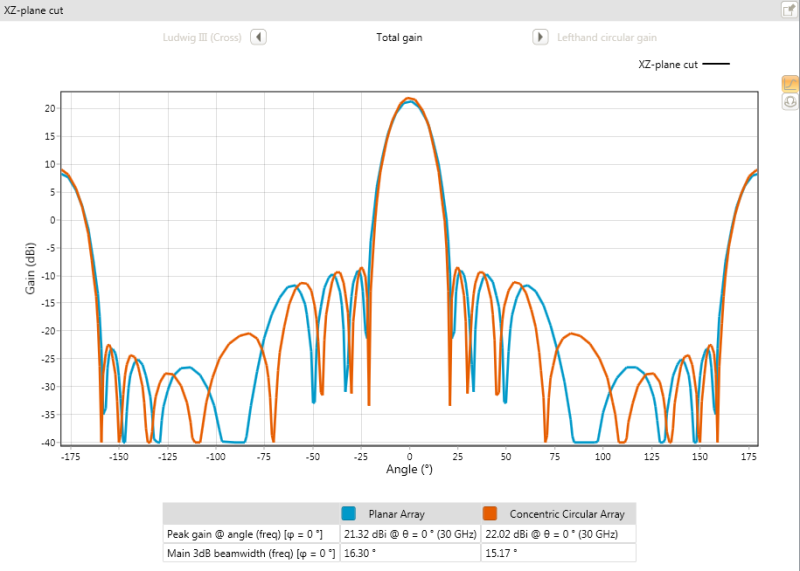 We are designing for the same beamwidth and side-lobe level as the previous design. In the 'Derived Parameters' we note that the number of elements required (77) for this array is higher than for the planar array with similar design objectives. The physical size of the array is also slightly larger than for the planar array. 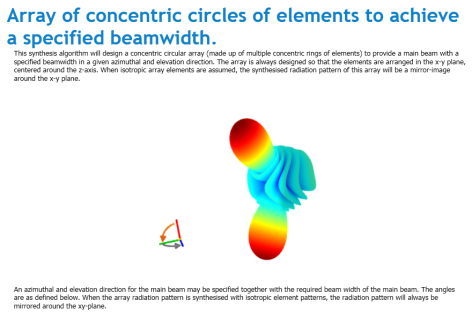 Navigate to the 'Element pattern' tab to set the node radiation pattern. Select 'Left-had-circular QHA' from the 'Choose Pattern' drop down; set 'D_max' to 'Z' and click on 'Apply'. The radiation pattern for the antenna is displayed in the workspace. This radiation pattern will be used in the synthesis of the array. Navigate to the 'Synthesised Array ' to view the results. In the workspace we can compare the results of the two array configurations. Shown below is the XZ-plane cut of the radiation pattern of the two arrays. Note the similarity of the two plots. We can also compare the 3D synthesised array pattern by switching between the two designs in the 'Arrays' expander located in the 'Pallet '. Shown below are the two radiation patterns side by side. Here the difference between the radiation patterns of the two designs are more noticeable. The concentric circular array configuration results in a pattern which is symmetrical around the vertical axis with more evenly shaped sidelobes. 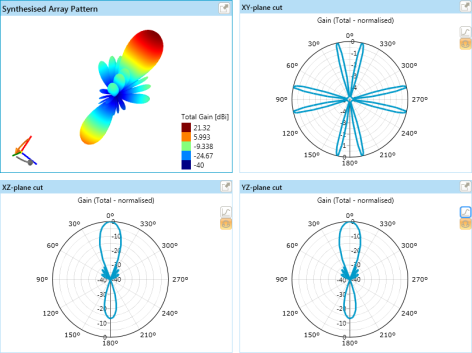 We looked at the design and synthesis of two antenna array configurations. The configurations were compared by designing them both for similar objectives and then inspecting the synthesised results and noting the differences in physical attributes.We noted that the main beams of the two arrays were almost identical where the concentric circular array has a symmetrical pattern around the vertical axis with smoother sidelobe distribution compared to the square planar array.